What emerges is a well-researched documentation of how sedition laws are currently being used in India and its implications for free speech and the spirit of a liberal democracy. The author, an assistant professor at the School of Law, Governance and Citizenship, Ambedkar University, opens the book with a February 1, 2017, incident at the University of California-Berkeley where mob violence erupted on campus with 1,500 protesters demanding the cancellation of a lecture by Milo Yiannopoulos. The British author, notorious for his "racist and anti-Islamic views", was ultimately forbidden from delivering his public lecture. This led to "a chain of reactions on desirability and limits of freedom of expression within American democracy -- the Left-leaning intellectuals and politicians were accused of allowing mob violence while the cancellation of Yiannopoulos' lecture also conveyed that only liberals had the right to free speech". Singh then shifts her focus to 2016 in India when "a series of criminal cases were registered involving the act of sloganeering in support of the right to self-determination of people in Kashmir". She elaborates at length on the fiasco that unfolded at Jawaharlal Nehru University (JNU) after some of its student leaders were charged and arrested for sedition. But what leads Singh to draw a comparison between Berkeley incident and what happened at JNU? "The incident at Berkeley," she elaborates, "presents... a case, in which restrictions on free speech was demanded and justified in the name of protecting what is largely called the 'liberal-democratic' values from illiberal political opinions. In the Indian case, however, the restriction on the right to freedom of expression of individuals was justified in the name of coagulating state security". These two separate incidents that took place in two different countries serve as the two pillars on which the larger framework of "Sedition In Liberal Democracies" is placed -- the debate over the centrality of free speech and restrictions on the same. The author is quick to remind us that these concerns gain prominence only in liberal democracies as an authoritarian state does not recognise the individual as "a right-bearing citizen" and therefore "is inappropriate for any debate on freedom to take place". So how does the author describe a liberal democracy? "A fraught combination of competing tendencies and traditions, since it attempts to bring together liberalism and democracy, on the one hand, and the imperatives of democracy and the state, on the other." The book largely deals with those forms of expressions within liberal democracies that are uttered against the authority of the state. The state of freedom of expression that citizens have against the authority therefore becomes crucial. 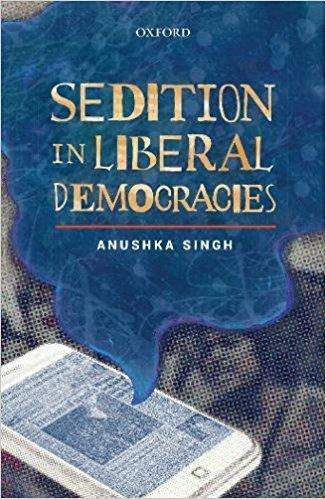 A scholarly offering, which has been sufficiently footnoted and carries a Bibliography section, is ideal for anybody who wishes to delve deeper into the very concept of liberal democracies and understand how the concept of sedition is different on paper than how it is perceived by citizens or applied by authorities. The book looks at sedition laws in its current form and uses it as a lens to probe the fate of political speech in liberal democracies.